Diabetes is a complicated disease. But what shouldn't be complicated is separating truth from myth about it. 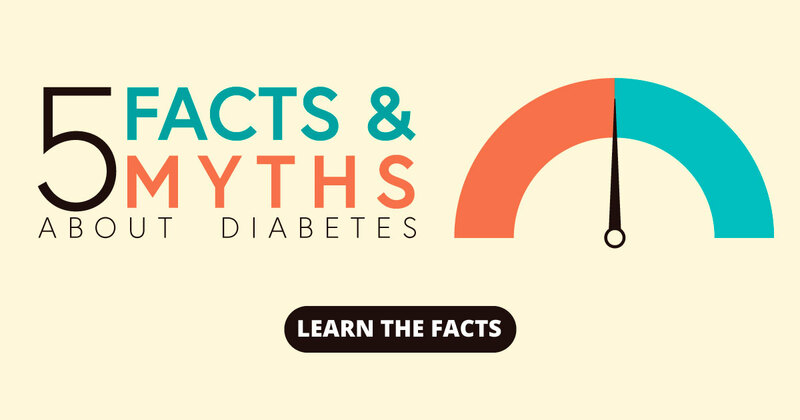 Knowing the facts could help millions of people avoid diabetes or prevent its complications. You won't develop diabetes just because you're overweight or obese. Being overweight is only one of several risk factors for type 2 diabetes. Other risk factors include your family history, your race or ethnicity, and your age. Most people who are overweight never get type 2 diabetes. And many people with type 2 diabetes are of normal weight or just moderately overweight. Eating too much sugar causes diabetes. Type 1 diabetes is a chronic condition that's related to genetics and other, unknown factors. Type 2 diabetes also is related to genetics as well as certain lifestyle factors. Drinking sugary beverages, which are high in calories and can cause weight gain, has been linked to type 2 diabetes. But it's not accurate to say that a person will get diabetes from eating too much sugar. People who have diabetes can eat the same foods other people eat. What's healthy for people without diabetes is healthy for people with diabetes. There's no need for people with diabetes to eat so-called "diabetic" foods. People with diabetes can't eat sweets or chocolate or starchy foods like bread, potatoes and pasta. There are no "forbidden foods" for people with diabetes, but portion control is key. People with diabetes should try to get most of their carbs from fruits and veggies, beans, whole grains, and dairy. But starchy carbs or occasional sweets are not completely off-limits. They can be enjoyed as part of a healthy lifestyle that includes a nutritious diet and regular exercise. Needing to use insulin means you've failed to properly manage type 2 diabetes. Many people with type 2 diabetes start out taking oral medications to keep control of their glucose levels. But type 2 diabetes is a progressive disease in which the body's ability to produce insulin lessens over time. Many people with type 2 diabetes eventually need to use insulin. Learn more facts about diabetes by taking our quiz.